Assembly is quick and easy. Drain the maraschino cherries first and let them dry, then pat them with a paper towel to absorb excess moisture. This keeps the juice from turning the dessert pink. Of course, if you want it pink in a tie dye sort of way. . . . . don’t worry about this step. The cookie crumbs won’t stick together with the butter, but make an even layer across the bottom. They will absorb moisture from the filling and make a light, firm crust for the dessert. A 9×13 inch pan will yield 12 to 15 servings depending on size. Super smooth, super good! All the tropical goodness of pineapple and coconut in a super smooth no-bake dessert! Drain juice from cherries and spread out on paper towel to dry until needed later. Place wafers in sturdy gallon zipper bag and smash to crumbs. Pour into medium mixing bowl. Beat together cream cheese and cream of coconut until smooth. Dice cherries, pat with paper towel to absorb any excess moisture. Add pineapple and cherries and fold into mixture. Spoon evenly over cookie crust and spread carefully. Top with coconut and refrigerate for at least three hours or overnight. 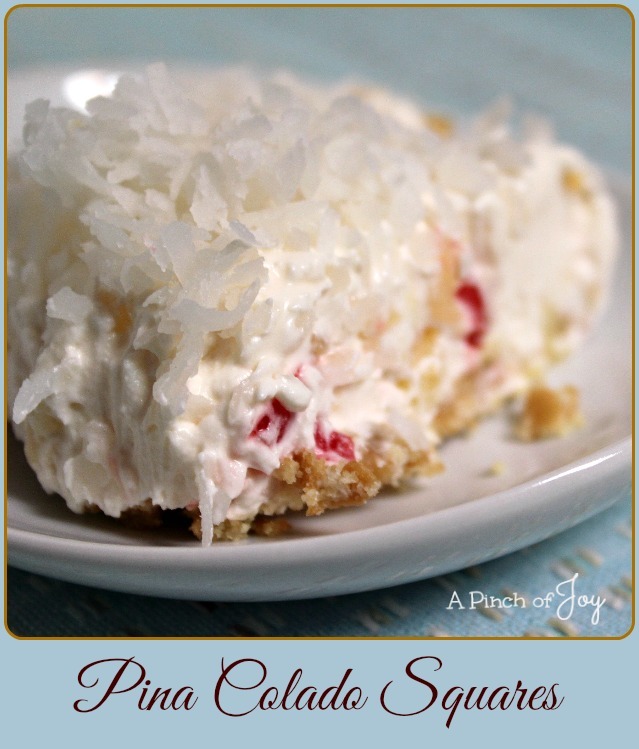 We will just love your Pina Colada Squares, I am pinning this recipe! Thanks so much for sharing with Full Plate Thursday and have a great weekend! this looks SOOO good! I love pina colada flavor!! YOU are featured today over at Nap-Time Creations for the party features.. come on over and check it out!! !